It happens to all us arty folk...the dreaded creative's block! It can be down to a lack of inspiration, fear of how to begin a piece of work or simply being unable to think of anything to draw. Drawing a blank can rear its ugly head during a paid-for commission or when you are drawing just for fun. The struggle is very real, but do not panic (this is the worst thing you can do)...I have some tips for overcoming any creative lull. 1. Don't wait for inspiration to come to you. Try not to kid yourself into thinking that if you wait long enough, inspiration will just appear as if by magic. Unfortunately, it will not. You'll just drive yourself mad wishing it to strike. There is no way to force yourself to feel creative, but what you can do is try to put yourself in inspiring scenarios. Something as simple as going for a walk, chatting to a "real life" fellow human (being a freelance artist can be a lonely life!) or doing a spot of gardening can do wonders for refreshing your mind, and providing a bit of a reset. You could also seek out some more obvious places for inspiration – visit an exhibition, go and see a film you've been wanting to see for ages...or go to a nature reserve. Just be proactive. My favourite ways to reset are shopping for plants, walking in the countryside and gardening. Don't be afraid to step out of your comfort zone. Sometimes your creative rut will come from being stuck in your "safe zone" – the uninspiring, autopilot, drawing-style that is your natural go to. This is a great place to start from when you need to get a paid for commission completed, but it can make it hard to feel inspired. Don't be nervous to try new things, and you will quickly begin to feel excited about a project again. Playing by creating work nobody will ever see is a wonderful way to break through an artistic block, wihtout the fear of judgement. Try out some drawing techniques that you have been meaning to have a go at for a while, or revisit mediums you used to love. Just draw for fun by drawing whatever you want. I recently did just this. I wasn't feeling as in love with the process of drawing as I wanted to be, so I took an afternoon to step away from my computer screen and digital painting medium. I was able to sit in my garden with paper and a pencil and really enjoy taking the time to draw my beautiful cat, Bess, in a completley different style to my usual illustrations. I have to say, it worked. I felt reset and relaxed, and it felt so good to do something different – and you know what, I am pretty pleased with my pencil study too! Swapping digital painting, for a pencil and paper, to draw my lovely Bessy. 3. Be a social butterfly. To expland on a point I made in tip no. 1, being a freelancer can be a little bit isolating at times. Even if you are a disciplined individual, that loves their own company, don't underestimate the power of getting out to meet up with friends and family or meeting new people. Socialising is a wonderful way to clear your head, and some of the best inspiration comes when you're just living life rather than fretting over work. You never know, someone may say something to you that sparks an idea for a new project too. Getting out with friends and family is so incredibly important. 4. Tidy desk, tidy mind. This isn't one for everyone, but it's one I swear by. 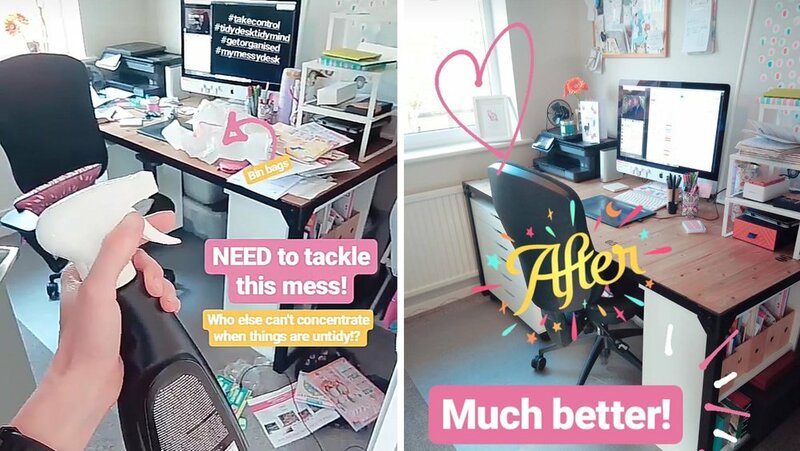 Infact I take it one step further and tidy the whole house when I feel particularlly frazzlled or unable to concentrate on the job in hand. It's amazing how often an artist's block can be cured by engaging in a little bit of cleaning up your work space. Set your desk up to be functional and helpful (it can still be pretty), rather than stressfully chaotic. You'll feel accomplished, relaxed and ready to smash it, with your flow back on track. Here's my little space - what a difference an hour makes! Follow more behind the scenes on Instagram. Finally, don't be afraid to make mistakes. All the best ideas come from the process, so be prepared to try new things, mess things up, and scribble through your mistakes. Don't rush if you're stuck...just stick with it, keep going and inspiration will come eventually. What are your top tips for getting out of an artist's block? I would love to hear how you overcome your creative lulls. Older PostHow I illustrate your portraits.